This Casino Las Vegas review reflects the positive experience that any online gamer will have using their carefully organized lobby and Playtech gaming software. Casino Las Vegas rounds off the experience with good customer service and banking options. Hit the slots at Excalibur and enjoy a romantic gambling experience in Paris while the Romans at Caesar’s Palace gamble with their empire’s future… As I’ll explain to you in this Casino Las Vegas review, this is an online casino that properly captures the multitude of options available to you on the Vegas strip itself! With an organized lobby and properly produced gaming experience, Casino Las Vegas brings Vegas to you in your home. 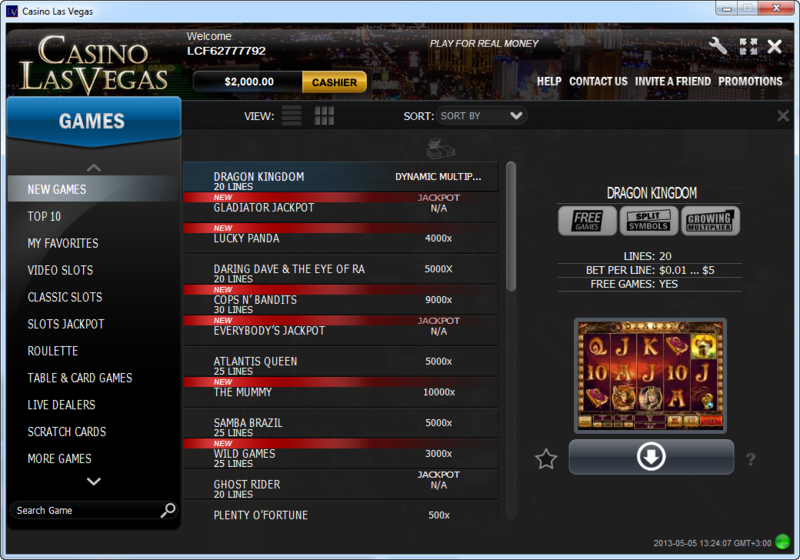 Running on Playtech casino software, Casino Las Vegas provides good organization in their lobby. With a great view of the Las Vegas Strip lit up at night, your gaming choices are expertly divided into categories in a drop down menu to the left. This allows you to access every game in a logical manner so you can never get lost or confused and can always find your favorite game. Graphics range from excellent to very basic so you can choose depending on your taste. Gaming quality is also a plus with Playtech software. The Casino Las Vegas suite includes Playtech’s line of Marvel video slots where the massive Marvel jackpots can be won randomly. Besides these slots Casino Las Vegas has a large selection of classic casino table games and slot machines. Graphics range from excellent to very basic so you can choose depending on your taste. 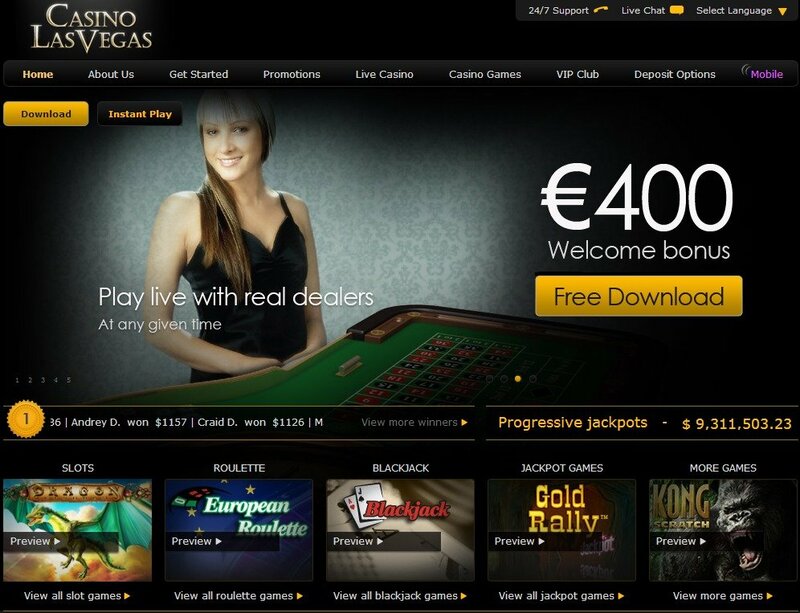 Casino Las Vegas also provides the same standard of gaming at their live casino and mobile casino. At the time of this Casino Las Vegas review they were offering a medium sized $400 welcome bonus over the course of your first four deposits. Deposit $100 each time and you can get 100% added on with the Casino Las Vegas bonus. Casino Las Vegas bonuses also include smaller giveaways for specific games and daily updates. There’s even a small reward for successfully getting a friend to sign up. The real rewards lie in becoming a loyal VIP player however, where you can move up the ranks earning bigger promotions and other benefits like quicker withdrawals. Casino Las Vegas provides a solid number of payment options ensuring that all players will be able to both deposit and withdraw comfortably. Though Casino Las Vegas doesn’t allow customers from the US to deposit in their casino, their payment options help bring the Las Vegas experience to the rest of the world. Casino Las Vegas is available for play in 9 different languages that are all supported by a quality customer service system. Their system is cleverly divided into different sections so that you can be sure to get the quickest and most efficient service possible. If you need help with deposits or withdrawals you can email an expert who deals specifically with banking. This is also true for business inquiries and technical issues. There is even an email for general questions that don’t fall in these other categories. Besides email you can start a live chat or fill out their form online to have a real person give you a phone call. Looking for some info here – Im quite keen to try out this casino, but before I give them all my loot, I would appreciate it if others would share their experiences… Thanks. What banking can I use to withdraw payouts? Thank you for your question – Casino Las Vegas accepts Visa, Mastercard, Neteller, Skrill, PoLi, Paysafecard, and Entropay.